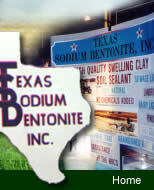 Project: Soil Testing Services for Texas Sodium Bentonite, Inc.
Alpha Testing in San Antonio, TX received a sample of bentonite clay on Wednesday, October 24, 2012 from Texas Sodium Bentonite, Inc. for laboratory analyses. Classification tests were performed on the submitted sample and consisted of the Atterberg limits tests (ASTM D 4318), percent fines test (or the Amount of Material in Soils Finer Than No. 200 Sieve (ASTM D 1140), and the ýas receivedý water (moisture) content (ASTM D 2216). The results of the laboratory analyses are presented in the table below.